To obtain numeric values that should be displayed within a dashboard item, Dashboard calculates a summary function against the specified measure. This topic describes how to specify which summary function should be calculated against a particular measure. The following summary functions are available. The number of values (excluding Null and DBNull values). This is the only summary type that can be calculated against non-numeric data. The sum of the values. The average of the values. An estimate of the standard deviation of a population, where the sample is a subset of the entire population. The standard deviation of a population, where the population is the entire data to be summarized. An estimate of the variance of a population, where the sample is a subset of the entire population. The variance of a population, where the population is the entire data to be summarized. By default, Dashboard calculates Sum for numeric measures and Count for measures that contain another type of data. You can change the summary function type for numeric measures. 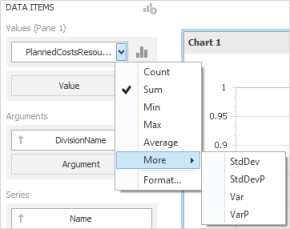 To do this in the Designer, invoke the data item menu and select the desired summary type. Less common summary types are organized in the More submenu. Summarization - InLoox • Copyright 1999-2019 © InLoox, Inc. All rights reserved.